Brianne: Hello everyone and welcome to a fabulous expert interview today with my friend, whom I met at a training, an aromatouch training. We're actually both with Doterra essential oils. We love the essential oils, but we're not talking about essential oils today. We're talking about sleep and you might wonder why we're talking about sleep. Well, here's the deal: Christine Hansen is my guest today. She's a sleep coach and a sleep expert and the author of a book called "Sleep like a boss". I want everyone to check this out. Sleep is so important and she's gonna tell us, how it could actually improve our pelvic health. I know that so many of us, so many of you who are watching, are women who maybe have some core pelvic floor weakness; some dysfunction. Many of you are new moms and you have little ones at home and your sleep is probably a little bit off kilter. Many of you also may have pain or just comfort issues in the pelvic area and that can certainly affect sleep and when your sleep is bad. It makes it harder for you to live a thriving life, as far as your musculoskeletal health and all of that. So I am going to let Christine kind of take over and tell us a little bit more about, first of all, who she is. So Christine, who you are, why you got started with this and also, let's just dive in to how sleep can actually impact your pelvic health. Christine: Yes. Thank you so much for having me, Brianne. It's lovely being here and I'm so glad we met. My passion is to transform people's sleep. The people that I work with are usually people, who want to sleep but can't. They probably have a great sleep hygiene already, read all the books, went to get professional help and then they've probably only been told to take a pill or have been told they have a depression or that they have to take some pharmaceuticals in order to get back and they inherently know that that is not the only way and all they are being told, is that everything's okay, but they feel like crap. Very often they are not ill in terms of an emergency, but they are not healthy. So their life quality is very much impaired. A lot of the time I'm dealing with people, who have chronic pain. Sleep is the third pillar of your house. So you have your nutrition, because everything that goes into your mouth through your skin is going to be used by your body positively or negatively, in order to fuel you or it's going to impact your genes, your DNA, your epigenetics. Nutrition is important. Movement of course, that's more your turf and then sleep is the third one. Sleep is like after the party's over. 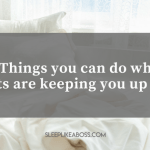 It's taken care to clean everything up, repair anything that's gone wrong and so it can't do that when we are awake and so when we are sleeping lots of things are going on: We have hormone balancing, everything that's kind of gone out of balance during the day. Sleep is trying to repair it as much as it can. Obviously, if we have chronic stress, it's getting more and more difficult, but therefore it's more important that we support our body doing that. It's helping repair muscles, it's helping to replenish bones because we are losing a lot of bone material through stress, especially if you're someone who does extreme sports like marathon running, it's draining a lot of minerals and vitamins from your bones, so sleep is replenishing those, it also takes care of our brain. Our brain actually shrinks so that cerebral fluid can flush any toxins out that have built up and that is super important for mental health, but also for diseases like Alzheimer's disease, dementias, Parkinson’s and so forth. So sleep is really crucial and I always say it's no coincidence that nature has developed every mammal to sleep. I mean dolphins; they sleep with one brain hemisphere at the time so that they don't drown. So if nature goes that far out of her way in order to make us all sleep, it is crucial and human beings are actually the only mammals in the world that are depriving themselves of sleep on purpose, which is ridiculous. Brianne: That is so interesting. You're right, I mean nature would make it so that we would be sleeping so much more than we do, but we don't have to sleep now with light artificials, all things keeping us up at all hours of the day. We don't have to. So of course we're like those kids at the party who are just like, I want to keep partying. I love that analogy. I love the "after the party" part. I love it when everyone leaves and I am alone and I can clean the house. So that is, that's an amazing analogy. It's fantastic! I think you've already explained it about, you know, naturally detoxifying, building up your bone strength and your muscles overnight. 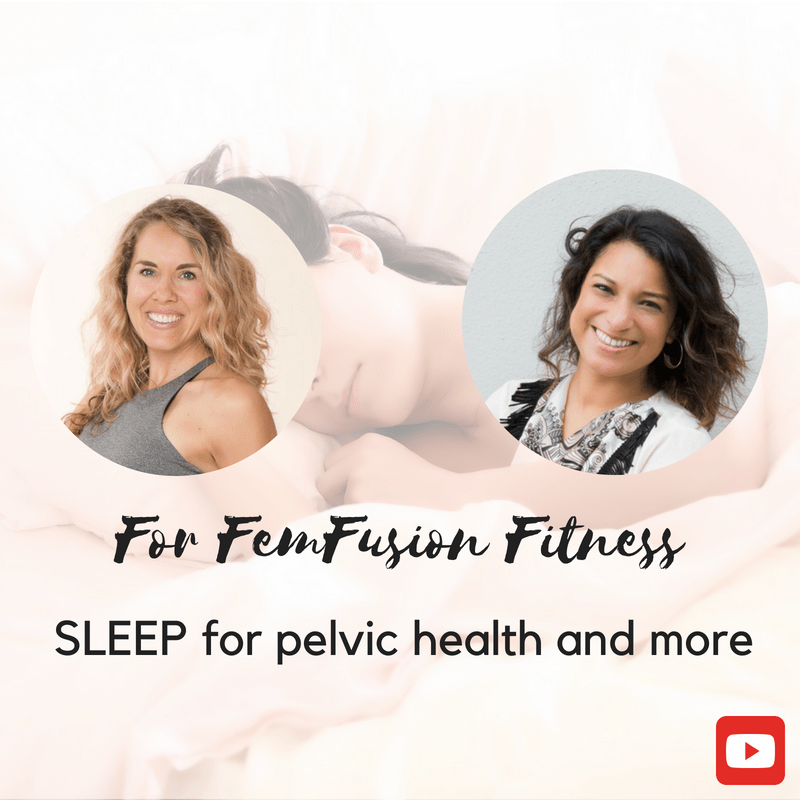 Is that the primary way that sleep could affect our pelvic health and our core health or is there anything else kind of physically musculoskeletal that would be important for sleep. Christine: I think one of the big points that we potentially address is pain, because a lot of the time when you don't sleep enough, your pain threshold is a lot lower. They made experiments with sleep depriving people and having them stick their hands into ice water. They did it once when they were completely rested and ones when they were sleep deprived and the pain threshold was just very different. Now it is a bit of a vicious circle, because obviously when you are in pain you're not sleeping as well and when you're sleeping not as well, your pain is getting worse. You need to address all the different points that might impact your sleep, which is sleep hygiene, but also your thyroid, your hormones, your gut health, your nutrition and when you can support sleep, it's going to be easier and then your pain will also be supported in order not to be quite as acute as it would be. In terms of muscle repair it's really been shown that every day our body is like a machine, so every day we have a little bit of wear and tear. Those could be little ruptures, little fishes and sleep is literally going in and is preparing that. If you look at an old timer car, those cars weren't built to run that long. If you take a good care of them, then they can. I'm not saying that we can live forever, but we can definitely extend our lifespan, if we take good care of our body. Sleep is absolutely crucial in doing that. Whether it is in muscles, whether it is your bones, whether it is inflammation, sleep is just your natural anti-inflammatory. It's like a natural healing vessel that you really have to respect and that is going to help you lot on your journey. Brianne: That makes perfect sense and yeah, a lot like the pain threshold like you just mentioned, probably also if you're not getting enough sleep, you're not going to want to go get your workout and you're going to be groggy and tired all day. So you're not going to want to exercise and strengthen yourself. So how much sleep do you recommend people get every night? Is that the million dollar question? Christine: It is a very familiar question and I love answering it. The correct answer is that it's your perfect sleep length is you go into bed falling asleep within 20 minutes happily and peacefully and waking up the next morning being refreshed. That's the answer. Whether that is six hours, whether that is 8 hours. Brianne: Quick question, really quickly on that. That actually makes a lot of sense to me, because tell me if this is crazy, but sometimes I know I feel good when I sleep 7.5 to 9 hours. But sometimes I also just have this intuition that it's going to be totally okay if I sleep less for some reason. Maybe I have a big work project that I'm happy about, not something I'm slogging through, but something I'm excited about and I want to stay up until midnight and I want to work on it and I know I need to get up at 5:00 AM, but I choose to do it and I am okay the next day. Is it okay sometimes to get less than the eight hours a day you're supposed to get? Is it okay every once in a while. Christine: Absolutely! You can't be too harsh with yourself. Your life shouldn't just revolve around your sleep. However, it's okay if you manage to catch up at some point. Either have a nap or have a rest or have the next day to catch up a little bit. The reason why I'm saying it is flexible is because these 8 hours can actually stress people out. You know? They're like, oh, I need to get eight hours now. I'm not getting eight hours, so my day is ruined. No, you will survive. It's going to be fine. Even if you only slept five hours are going to be tired, you're going to be groggy, it's going to be fun, but you will be okay and sleep is only always going to take what it really needs. So people are like, I'm afraid of dying because I'm not sleeping enough. Your body is going to take what it needs it, so don't worry about that. It is taken care of you. Obviously, I prefer if you can, try to sleep as much as you need, also because we are fooling ourselves very often that we are more productive, when sacrificing sleep because we cram more hours into the day. But the truth is that you will be less focused. You will do mistakes that you don't notice. Your mind will wander off without you noticing. So that's a big one, because when we are refreshed and our mind wanders off, so when we are in flow and then suddenly would drift off with very quickly catching it and return back to focus. When we're sleep deprived, it takes us a lot longer to actually realize that we are drifting off. We're wasting a lot more time. There are lots of things like that where I'm saying, okay, if you are completely in the flow, absolutely you know, once in a while, totally fine, I do that. But if you're someone who chronically says, okay, I can't sleep, I can just sacrifice sleep or put it on the back burner for a while, because I have so much to do, it's not going to be in your favor. The quality of the work that you're doing is not going to be as great and you're basically getting dumber, literally. It's literally affecting your brain power. So it's not always a good substitute to put it that way. Brianne: Okay, that makes sense. So it's okay every once in a while, but for the most part we want to be focused on getting sufficient. I could talk to you about this all day, but I know we have a time limit. I'm going to ask you two questions and you can tell me if there are myths or not. 1. I've heard that it's really important to get up at the same time every day. So even on the weekends, don't sleep until 10:00AM if you usually get up at 5:00AM. 2. I've heard that sleep happens in; I want to say 90 minute cycles. It's good to get 6 hours vs. 7 hours. No, excuse me, I'm saying that wrong... Anyway, there are certain chunks of time. Can you address those? Christine: Absolutely! They are great questions! I love them. So the first one is once you've established how much sleep you need and you can do a little experiment on yourself, you can basically see, okay, I'm going to bed pretty early and I would see when I wake up or I'd go to bed late and sleep deprive myself a little bit and then reverse engineer until I can go to bed and wake up refreshed. Once you know your chunk of time, you basically reverse engineer it and take the time that you have to get up. Let's say 6:00 AM, reverse engineer the hours and that would be your bedtime and then yes, stick to that wake up time, because if you don't, you will get yourself into jetlag and it's going to impact your natural rhythm, because it's perfectly calibrated and then if you give it more time over the weekend, it's going to get confusing and you'll be in jetlag on Monday when you have to get up again. Especially people who have trouble with Circadian Rhythm. People who, for example, are night owls, who would naturally go to sleep at 2:00 AM and wake up at midday. We are really talking about Circadian Rhythm Disorders, they absolutely have to stick to the same wake up time and I had a client with 15 minutes made a huge difference. If she got up 15 minutes later, her whole day would be ruined. And ever since I've worked with her, that's really one that I ask people to stick to, especially if they know how many hours of sleep they need. Super important! The other thing is with the sleep cycles is absolutely true. Our sleep is not just one line its circle cycle after cycle and one sleep cycle is 90 minutes, more or less. Babies’ cycle is 45 minutes. You can actually look at the clock and watch them wake up and then it gets longer. Every sleep cycle has three phases. It has light sleep, deep sleep and REM sleep, which is when we are dreaming and every phase has their task. So the numbers of cycles that you have varies. It can be 4 but most of us have 5. It's up to you to figure out how many you need. A lot of times I have clients, who wake up after 4 and have trouble to fall back asleep for the last cycle. They are still tired and missing a cycle and that's when you wake up at let's say 5:30 AM and it's impossible to go back to sleep. That is because your body is kind of rested enough, yet still tired. In that case, I just tell them to enjoy the time that they have until the alarm clock rings. Just turn around in bed and just say, I love my bed; I'm just going to rest and listen to some music listen to the news. Don't even try to fall back asleep, if you notice that it's not doable. Don't stress yourself about it. Just enjoy it or get up and take your time to have an amazing breakfast. Have some slowly brewed coffee, keep some croissants in the freezer and warm those up to have that lovely smell in the house. Do something with it. Brianne: Okay, that makes sense. So 4 sleep cycles would be approximately 6 hours, is that right. Brianne: Some people will wake up then and they just can't get back to sleep, when probably 7.5 hours would be maybe a little more ideal. Don't shock yourself by getting right into the day. I've always wondered for people who can't get to sleep, so at nighttime is their problem and they're having a hard time going to sleep. Do you have any quick advice for that? I'm sure that's a big issue for a lot of people. Christine: Huge issue. The number one thing is, you have to look at sleep like a person. Right? We can prepare everything to welcome our guest that sleep is. That would be our routine. Sleep is not like an on and off switch. It doesn't like to be hurried. It's a process. It's like shifting gears from a car, from fifth gear down to parking and so sleep hygiene can obviously help. It's helping to prepare the terrain. It's like setting the mood basically for your guest to arrive. But when sleep isn't coming, it's not coming. You know, people know they go to bed and they are like, Christine I knew right from the beginning that this wouldn't happen. Don't stay there. Sleep isn't there and it's not going to come any earlier. Some things happened for it to be held up in traffic. You're going to get mad, you're going to get anxious and you're going to get angry at your sleep and that is not helping. I advise my clients to not stay in bed. I advise them to get up and do something positive. Depending on what you like, it could be crossword puzzle, it could be reading something and it could be cleaning. I like cleaning. I really like doing the kitchen sink, cleaning stuff or it could be a vision board. I love having people gather magazines of things that they like and work on a vision board. Cut out things that make them happy and stick them on a vision board. It's something positive and when you feel yourself, yawning, when you feel your eyes are stinging, that's when sleep is basically tapping you on the shoulder and saying, got it, I'm here. Then you go back to sleep. Brianne: I love that and that just really rings a bell for me, because I feel that I am actually a pretty good sleeper. I do fall asleep pretty quickly, usually. However, full moons always keep me up, all night and I've actually, without knowing it, I've done what you say, like I kind of actually enjoy it. I kind of embrace it on those nights where I'm like, yeah, that sleep guest got held up in the traffic. It is not coming tonight. And so I also do, I try to go to bed, but when it doesn't happen and I'm like, it's a full moon, no matter, you know, no wonder, I'm not sleeping and I do, I get up and I usually don't do the vision board though and that's such a beautiful idea. It's very positive, very feminine and I'm kind of Yin, you know? Christine: Exactly and if you're a science geek, it's positive. It's triggering your serotonin. Serotonin at some point is converting into Melatonin, which is helping your body to get ready for sleep. We have the emotional pod and we have the scientific pod; both playing together, which is a win win. Brianne: Oh, that's beautiful. Wow. Thank you. I love this. This has been so fun. I know you're short on time today, so I think we're going to wrap this up. I feel like just to kind of summarize, we want to sleep because that's our natural time to heal, repair and rejuvenate our bodies. It also helps control pain and discomfort. So for those of us with core and pelvic floor issues and pain, anything like that, we need sleep and you said to focus more on getting up at the same time vs going to bed at the same time. You said it is more important to wake up at the same time. Think about those 90 minute cycles as best you can and if you can't get to sleep, don't stress about it. I love it. Fabulous! That was really helpful. How can people get in touch with you and maybe learn more about your book and just learn more about you? Christine: The easiest is you go over to my website sleeplikeabo​​​​​ss.com. You can also find me on facebook.com/sleeplikeaboss or just send me an email to christine@sleeplikeaboss.com. You can just literally shoot me an email and I'm going to answer you. I love connecting with people. I really love transforming people's sleep, so just get in touch. I'm very approachable. Brianne: I can vouch for that!! I don't know why we even connected at this event that we were both at, but somehow we just did. I remember, because you spoke English and it was largely a non-English speaking event. For anyone who's curious, we met at an event in Germany and Christine lives in Luxembourg. Very international!! Christine: Yes, I do speak German, French, English and Luxembourgish and we can talk in any of those four languages. Brianne: That's incredible! I bow down to someone, who knows four languages or was it five? Brianne: Amazing! Well, thank you again, Christine, for being on my show and helping people with their sleep. I think you're doing amazing things. It may not be the most popular. People might not think of it. Kind of like my work. People might not think it's the sexiest topic to talk about. Sleep or to talk about pelvic health, but it's fundamental. Christine: It is. I'm sending you tons of hugs. I wish I was there right now. Bye! Brianne: Bye Christine and bye everyone. Thanks for watching and as always remember, eat clean, move every day and sleep and you will shine brighter. Okay, bye everyone. Bye!